I really love the restaurants located at Bonifacio High Street Central. I've tried 'Cue, Village Tavern, The Mango Tree Bistro, and The Cake Club, and all have been nothing short of outstanding. 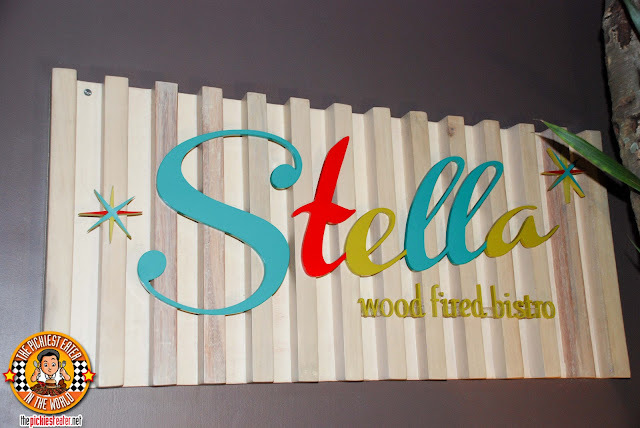 One restaurant there that had escaped my taste buds, was Stella Wood Fired Bistro. Stella, and its adjoining bar, "Rocket Room", is a part of the the Rain Tree Group, which conceptualized some excellent restaurants, such as Chelsea Market, Momo Cafe, and a personal favorite, Mr.Jones. Rina's High School friend Steph asked if we could meet up so she could introduce us to her boyfriend, Carlo, who happens to be a Filipino Chef that has been gaining recognition in Australia (good on ya bro!). When they asked me where I wanted to suggest to go. Although my initial reaction was to take them to one of the restaurants I had been to before, Rina suggested that it would be a great opportunity to finally try out Stella. 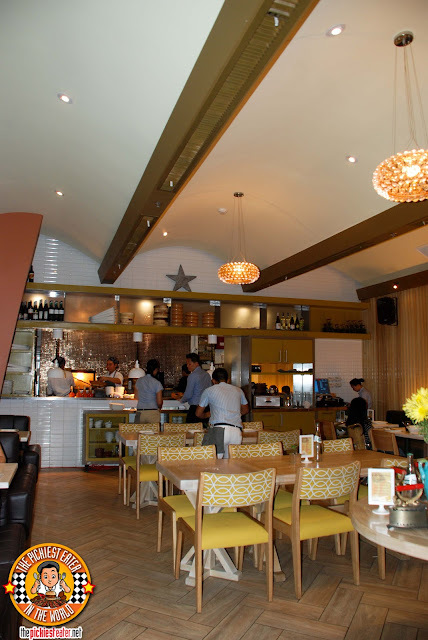 The area where Stella is located, is divided into two: Stella the Bistro, and Rocket Room, the Bar. Since I don't drink, I didn't bother checking out Rocket Room (Besides, it was a bit too dark to take pictures). The chic interiors identified it clearly as a member of the Rain Tree group. Stylish yet comfortable, with an open kitchen, allowing you to see all the wood fire action. 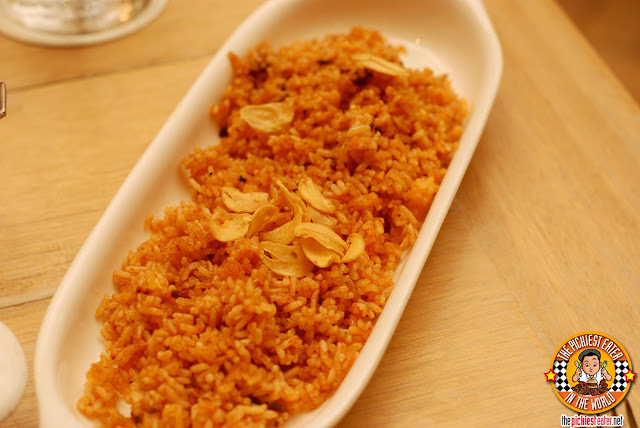 I ordered the Spanish Chorizo and Garlic Fried Rice (P90) to accompany my meal. Portion-wise, I think it should be enough for two people (unless you're my buddy Don, then it's just "solo size"), but then again for P90 bucks, you'd have to expect more than just a scoopful. 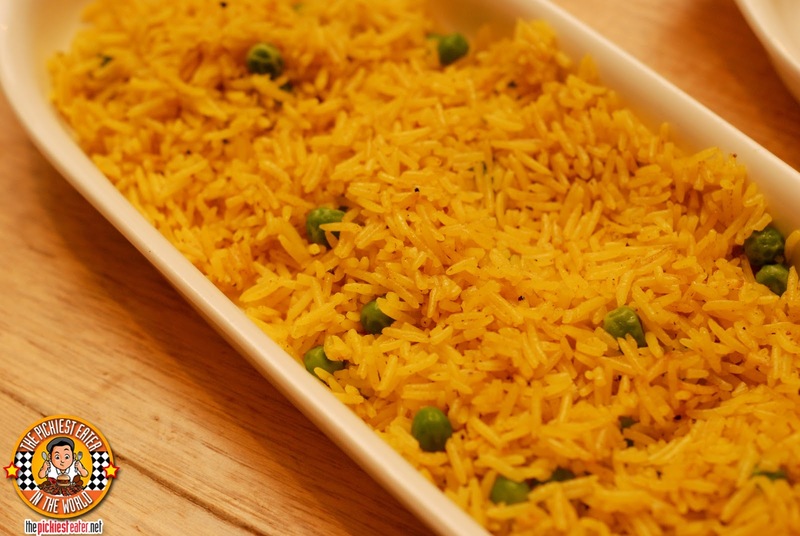 The rice helped add a flavorful, lightly tangy punch to the meals, although I think it could have used a bit more bits of Chorizo. Rina asked for the Yellow Basmati Rice (P95), which had a medley of Mediterranean spices and just a hint of curry. 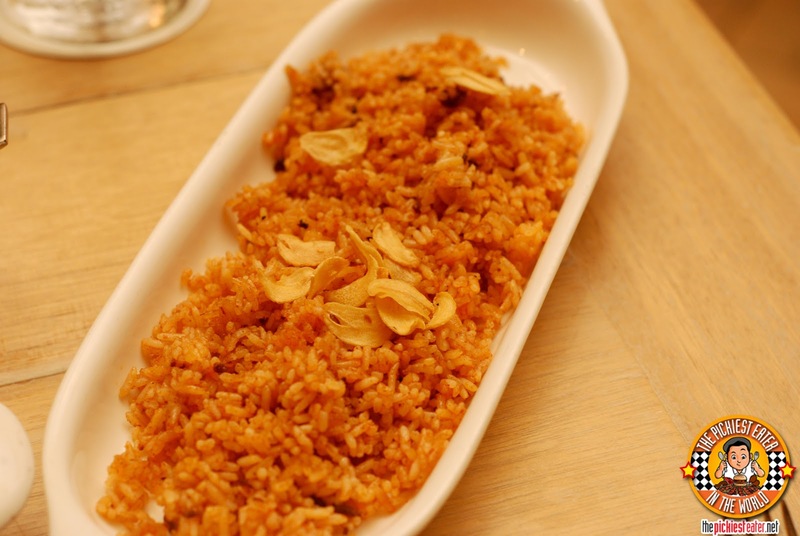 Although this was quite tasty as well, between the two, I preferred the Spanish Chorizo Rice. For my side dish, I ordered the Wood Fire Roasted Sweet Pumpking, which the menu said was "Topped with Ricotta and Toasted Almonds". Well, as you can see from the picture above, the amount of ricotta and almonds barely qualifies as it being "topped" with it. It honestly looked more like when they were plating another dish that required Ricotta and Almonds, my pumpkin dish was between the plate and the ingredients, and the Ricotta and almonds accidentally fell on top of the pumpkin dish while they were scooping it up, then decided to work with it. 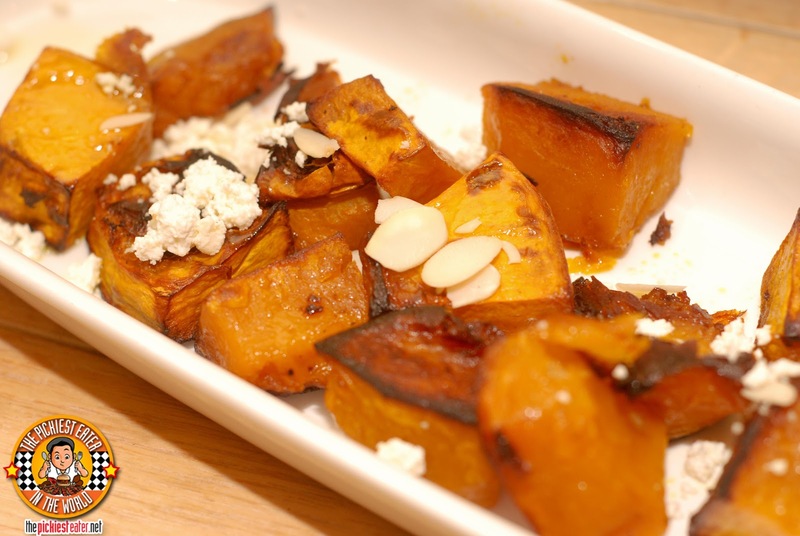 Apart from the lackluster amount of Ricotta, the Sweet pumpkin itself tasted delicious. It was roasted nicely, with the edges a bit charred but the pumpkin meat soft and a tad mushy.. Which is how I liked it. Rina's side dish was the Fire Roasted Butter Corn (P75), which woujld have been even more awesome had they not decide, for some unfathomable reason, to add peas to it (I have a strong dislike for the green little suckers,sorry). 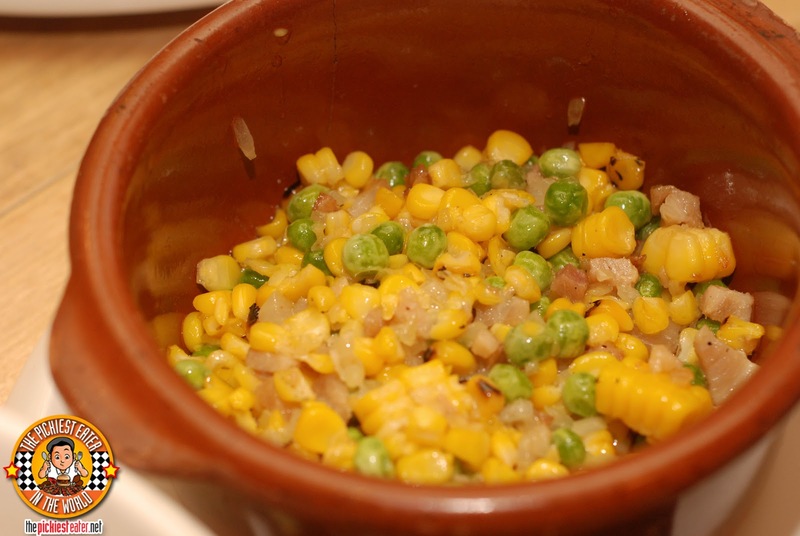 Mixed into the roasted, shredded, buttered corn, was bits of porchetta, that added to the corn, an incredible element of savoriness. I wonder if they'd allow me to exchange the green peas for more porchetta? Hmm.. probably not hehe. Rina mentioned that Steph really doesn't eat so much, so she wasn't surprised to see that her friend only ordered pasta for dinner (I say "Only" because to Rina, if there's no rice in your evening meal, it doesn't count as "dinner"). 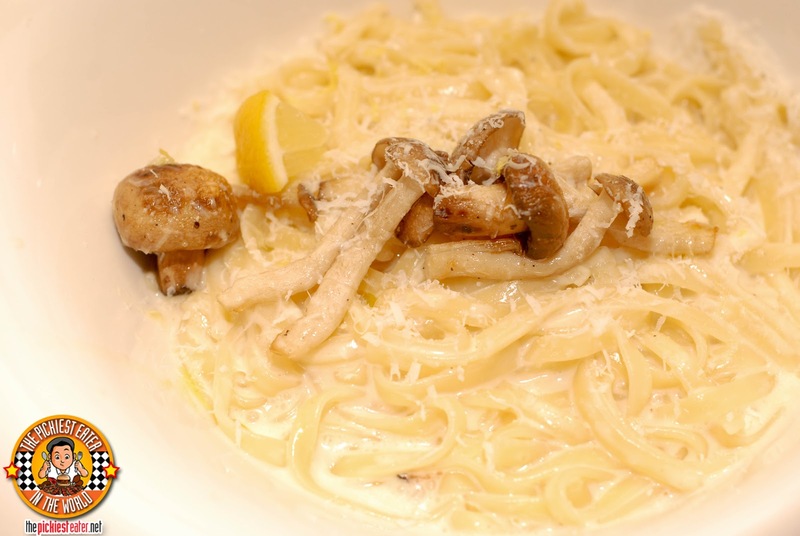 However, if you were to order a pasta for dinner, you could do far worse than Stella's Wood Fired Garlic Mushroom Cream Fettuccine (P425). I had a couple of bites of this (She only offered a bite, I snuck in another one hehe Sorry Steph) and I really liked it A LOT. The noodles were firm, and cooked to a nice Al Dente, but the main attraction to this was without a doubt, the cream sauce. It was buttery and creamy with the truffle oil tempering it from becoming too rich, and it worked wonders with the chunks of mushrooms. And the good thing about it? IT WAS WHITE SAUCE!! Meaning it was safe for me to eat (Tomatoes trigger my hyper-acidity). Rina ordered the Braised U.S. 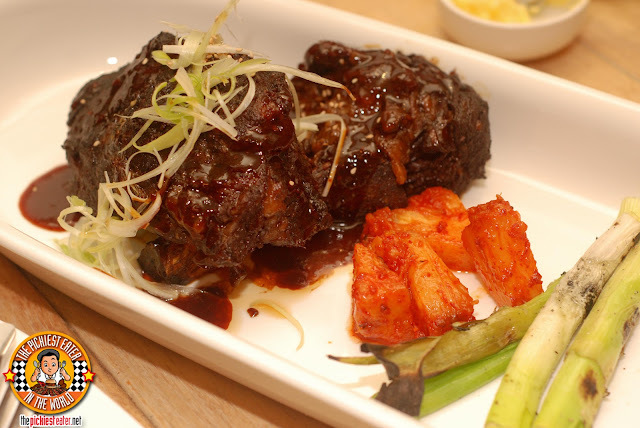 Beef Short Ribs (P495) (partly because she knew I wanted to order it as well.. isn't my wife awesome?). It was described in the menu as having a "Spicy, sticky, sweet sesame glaze".. Although the glaze was no doubt delicious, I don't recall this being spicy at all. In case you're looking for a little heat in your ribs, this isn't it. Carlo ordered the California Style U.S. Baby Back Riblets (P395), which were slathered in a herb-sundried tomato BBQ Sauce. 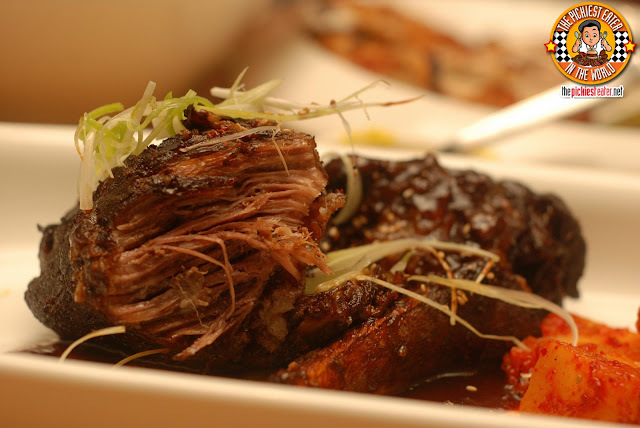 Like the Beef Short Ribs, the meat was extremely tender, and easy to slice through. 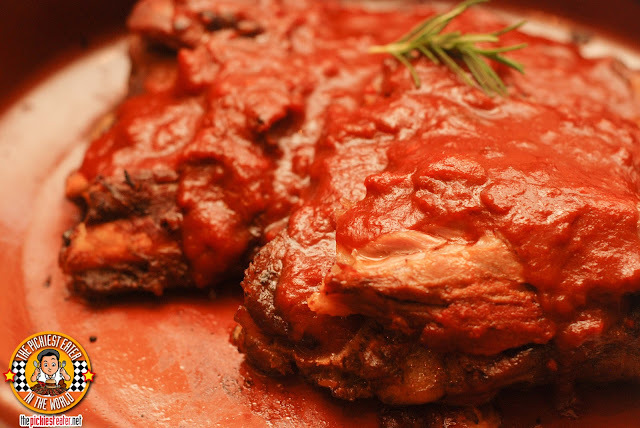 The strong flavor of the BBQ Sauce highlighted the flavor of the juicy meat, and the serving was rather generous. Between the Baby Back and the Short Ribs.. I would go for the Short Ribs! For some reason, the Stella Porchetta escaped me when I was going over the menu. I blame it on the Beef ribs and the Baby Back.. Because Whenever I see those two items on a menu of any restaurant, it immediately catches my attention. It was actually Carlo that pointed it out to me, as he figured that it's what I would probably order (He read my blog before). As soon as I read that it was a Pork Belly Roll that was stuffed with double smoked bacon, I was sold. 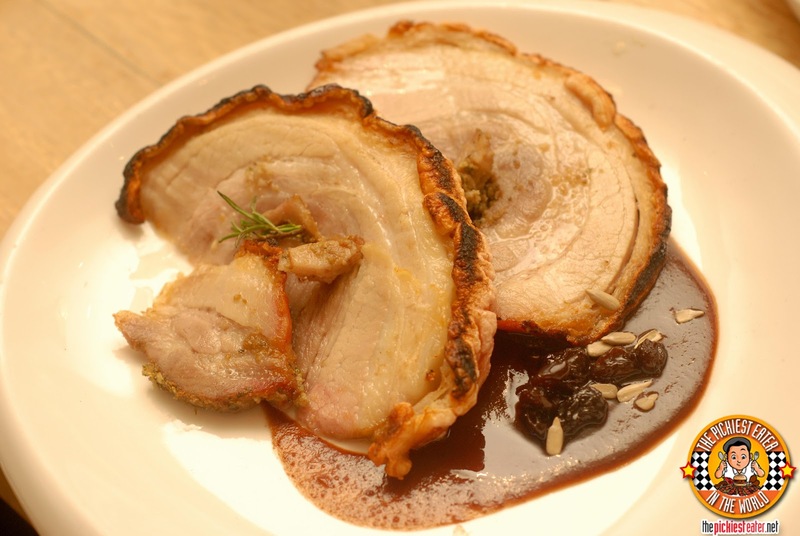 The thin slices of pork were extremely moist, and the flavor of the fennel and herbs that was also rolled into it helped the flavor of the pork to just pop. And the skin.. oh my gawd the skin.. The skin lining around the roll of pork was roasted to a crisp, almost chicharon-esque texture. It let out a beautiful crunch upon every bite. The meat also paired well with the lightly sweet Rosemary Sultana sauce. As good as this was, my only problem with this was.. Well.. I couldn't really find the "Double Smoked Bacon". The Pork Belly was delicious, the skin was fantastic, and the herbs at the center of the roll was amazing.. But I really don't know where the double smoked bacon was. Maybe it was minced up with the herbs and fennel or something.. but I just couldn't find it.. And as you can imagine.. That's what I was looking for as soon as they plopped it down on my plate. 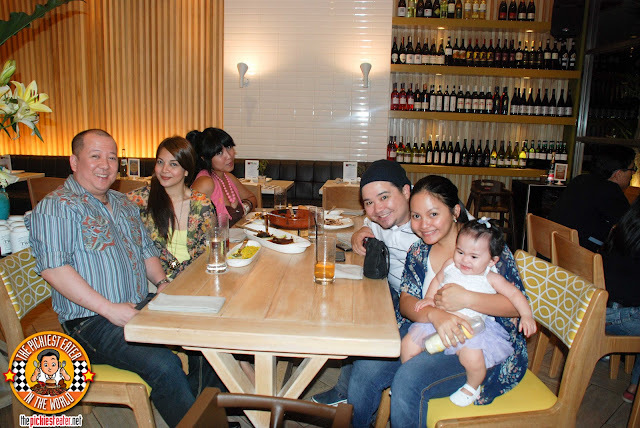 With great food, and great company, my Stella experience was a memorable one. Although it's a bit on the pricy side, Its actually a bit more reasonable compared to other restaurants in the area. I would love to go back to try the Pizzas, Sandwiches, and desserts! Darn I KNEW I should have ordered that! can't go wrong either way, bro! You didn't try the Truffle Mushroom? Why? Why? Why? Yeah sinadya ko talaga yan for you! nax! haha! share your post here when you write about it!